The astrological method of calculating progressions of the ascendant through 7 years per house rythmical activation was first developed during the german era of the renaissance of abstract astrology effected by the Hamburg School of Astrology also known as Uranian Astrology in the 1920ies. 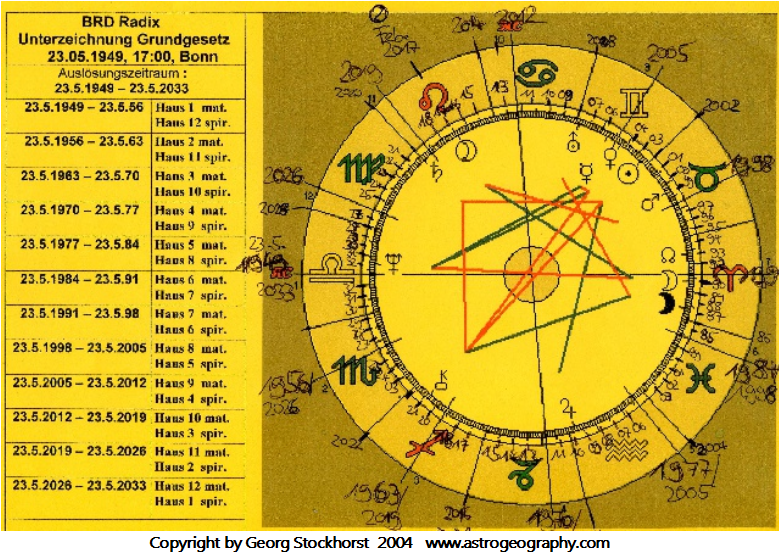 Frst authorship is mostly credited to Frank Glahn – who like most german astrologers of that era spent several years in a concentration camp during the fascist prohibition of astrology in Germany between 1935 and 1945. Between the 1960ies and 2014 the method was further developed by the great Döbereiner who published his findings under the name of Munich Rhythm Theory. The great potential of the method is that it allows a straight differentiation of the birth chart into 12 single life-phases of a full 84 – year life span. And the fact that it provides an overview in which historical events can be directly assigned to the planetary positions in the chart allowing comparison of the quality the events had for the country. I`m proposing to compare the activation of the Moon position as the indicaton of the “national question” during the unification of east and west germany in October 1990 from the West German Republic Chart with the moment of activation of the Moon in the Powell Chart in 1862. An example for the precision of the method of rythmical activation in countries` charts: the Moon in Aries (traditionally the sign of german culture) in the FRG foundation & constitution chart was directly activated in October 1990 during the unification of East & West Gemany. It`s position below the descendant – the constellation of the “lost fatherland or lost homeland” – explains how precise that method can appear in timelines of historical events. Technically I am proposing to understand one problem of the method of rythmical activation: the activation of planerts may fall a few months before (relating to the cause of an event) or after (relating to the effect of an event) the exact date of any historical event. We should consider that the direct activation of a planet resonates with the topic of an era or succession of events. When using this method for birth time rectification this logic has to be applied too. I`m applying the method for an easy overview over the comparison between the Powell Chart – a chart calculated for the first vote on the Independence of the USA on 1 July 1776 and the mainly symbolic so-called Sibley Chart. I have been trying to understand the Sibley Chart through rythmical activations several times in the last 15 years or so. But I have to say that it seems to have no useful resonance with the rythmic evolution in time that normally all real event charts should show. Döbereiner explained the idea that if an event is thrown into time its effects expand through time and space like ripples into eternity. The Sibley appears comparatively useless for this astrological consideration to me. Here`s my working version of the Sybley Chart as US Natal Chart with dates for rythmical activations. Activation works through progression of the ascendanct in 2 directions: the materialistic outlook via house 1 , 2, 3 to 12 and the spiritual outlook via haus 12,11, 10 to 1. Sibley Chart with data of rythmical activations. Of high importance should be events like the American Civil War, WW1, WW2, Kennedy assassination, Iraq War or others. As you see there were no planets directly activated between 1937 and 1951 (WW2) and between 1853 and 1867 (American Civil War) in the activated houses (Houses 1 and 12) neither for the material nor for the spiritual direction. Pluto was directly activated as late as 1868 – that means 3 years after the the American Civil War or else in 1951 – 7 years after Hiroshima and 11 ywears after Pearl Harbour. That simply doesn´t make sense. In WW1 there was no direct activation of a planet during the activation of house 9 for the materialistic perspective.. Lilith and Neptune were activated in 1921. But the fact that there were no planets directly activated during a problematic event of the highest category as WW1 with all the pain, trauma and depression that it held for the USA and the effective turn that the role of the USA in international and interior politics took through WW1 is a clear hint that the charts has little or no resonance with the important events of theat time. For the spiritual perspective Chiron on 20° Aries the degree of warfare was activated as late as 1920 – three years after the USA joined WW1. Again that makes no sense. Evaluation of the Sibley chart has led me to the conclusion that it is of no value at all. And I`m even rejecting the idea to use it as an indication of the self image of habitual american patriotism – although that may be suggested or even practised by many. Here`s my working version of the Powell Chart as US Natal Chart with dates for rythmical activations. Activation works through progression of the ascendanct in 2 directions: the materialistic outlook via houses 1 , 2, 3 to 12 and the spiritual outlook via houses 12,11, 10 to 1. Feb 1862 Moon at 15° CAP National question triggered – decisions of the states in the Federation and Union which side to join. The Moon stood for the era of emotional self-finding. Emotions still felt today about the hostility or friendship between different States in the Union had their roots in this era. Separatism was one emotion among many. After all the US Civil War may have served in creating a stronger identification of citizens with the USA than any other process the country went through. 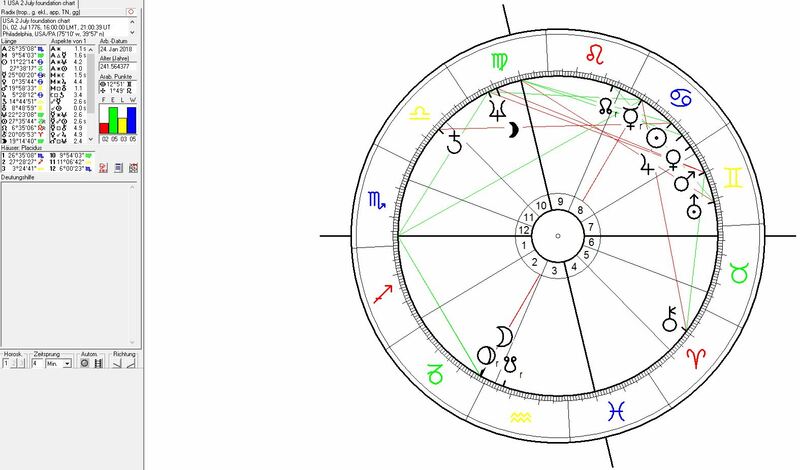 Rythmical activation in the Powell chart saw the activation of the moon in the center of Capricorn the sign of social hierarchy during the starting phase of the US Civil War – as the activation of the National question of which states belong to the country and which don´t. And it saw the full activation of the ruling caste system for the Southern Slave States aristocracy as well as in Yankee capitalism, Finally the activation of Pluto on 28°Capricorn during the final stage of that war – which reflects the negativity, destruction, suffering, the large armies of the phsysically disabled that were left over and all the traumatic effects that this war had on the US of A. The activation of Pluto in 1864 may have to in some ways overwritten or anyway have exerted a strong influence on the emotions created during the process of the activation of the Moon in 1862. Pluto forced the indentification with the Union onto the southern states. Sept 1869 Pisces ingress – the gold panic on Black Friday – 24 Sept 1869 occured right on the ingrees of the progressed ascendant from Aquarius into Pisces. Aquarius stood for an atmosphere of excited, innovative, quick and potentially maniac activity. The shift of atmosphere from Aquarius into Pisces stands for the breakdown of hypes, economical lows and depression. Feb 1915 Lilith at 18°VIR Beginning of German Submarine War against all merchant ships including American. Lilith stands for the invisibility of submarines, the unacceptable, forbidden “status” of such type of warfare. Dec 1915 Neptune at 22°VIR US hesitation to join WW1 – the USA was not willing to join the European War. Neptune stood for hesitation and even a state of paralysis. Possibly also for Wilson`s “goodwill”, the strategical (Virgo) deception through the german government and also for Virgo`s strong self-protective and reasonable intuition (Neptune in Virgo) that maged the american side hesitate to join the destructive, negative and poisoning european situation. April 1917 0°LI – the Libra ingress of the progression of the ascendant from the foundation of the USA saw the US entry into WW1 in the process and timeline of rythmical activation. The declaration of war against Germany had been delayed for a longer period as long as the progressing ascendant moved through Virgo the sign of careful action between January 1912 and the spring of 1917. That means until the renewal of german submarine attacks against the USA made the entry into WW1 inevitable. Libra indicated a defensive reaction by the US government. January 1920 Saturn -14° LIBRA: The Foundation of the World League of Nations and the 18th amendment act: the Prohibition. The activation of Saturn in Libra in january 1920 the sign of angels and naive painting makes the american Saturn seem to relate to purposes as those of the Salvation Army rather than those of European imperialism and colonialism. Saturn in Libra and square to the US moon position in Capricorn stood for the undecidedness and a certain lack of independent perception and evaluation. It also showed the hesitation of the US government to really make use of its full powers which it had demonstrated through its entry into WW1 once the war was won. The history of the undecidedness of the US foreign politics has shown such traits from that time on. The USA had no interest to become deeply involved into the effects of the 1500 years history of cannibalism among the European nations during the negotiations for the Treaty of Versailles (June 1919). Woodrow Wilson tried to pacify (Libra) the world instead through the foundation of the League of Nations in Jan 1920. This activation of Saturn in Libra saw the rise of the image of the USA as the helper of the world who comes to the rescue of human rights, peace, independence, democracy and emancipation of the weak and poor. And this ideal role at that particular time in history seemed and maybe really was to some extent natural for the USA. 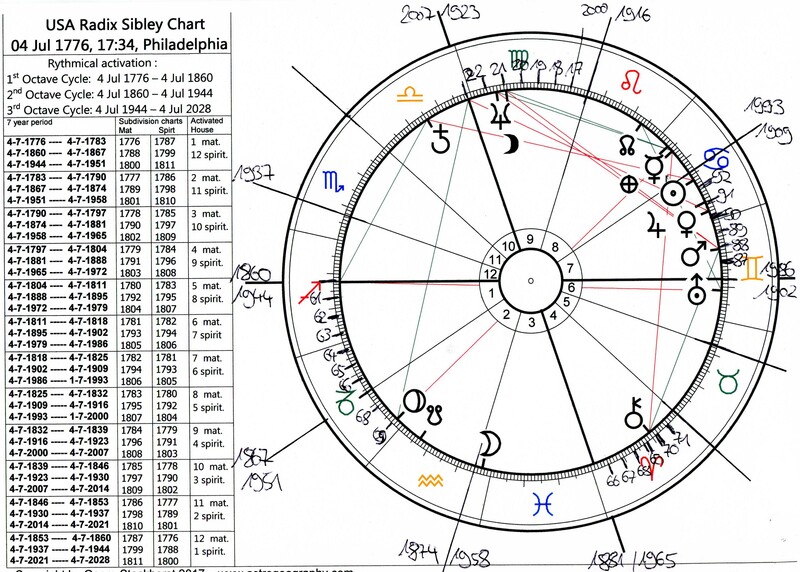 84 years later during the next rythmical activation of Saturn in Libra from the US natal chart the George W. Bush government finished with the remains of that US idealism during and after the Iraq war. After an interval of over 80 and a full cricle of progression of rythmical activation of the ascendant the constellations and houses from the American Civil War (1862-65) were triggered again shortly after WW2 (1941-45). This is valid for the materialistic as well as for the spiritual thread and timeline of activation. Apr 1946 Moon at 15° CAP USA as superpower in post WW2 era. This third direct activation of the Moon in the centre of Capricorn saw the USA take its role as the World Power No 1 even though due to the square from Saturn as the ruler of Capricorn in Libra the self-image of US americans did not want to take over full responsibility for that role. That role was sort of projected onto a role of being the helpers of others due to the position of Saturn in the sign of angels, justice, balance and peace. Therefore Stalin`s the strong and effective attacks on the american sphere of interest were not really foreseen and reaction came delayed. July 1948 Pluto at 28° CAP Berlin Air Bridge – 1st climax of Cold War. The activation of Pluto in July 1948 brough a moment in time when Stalin at pushed the expansion of the Soviet – Russian sphere of interest over the limits so that the USA was forced to react. The Berlin Air Bridge was a heroic american/british help to Germany and Western Europe as a whole. Pluto here shows that the USA was really forced to go as far as that. Jul 1963 Chiron at 20°ARIES Chiron on a degree of warfare on the descendant in John F Kennedy`s birth chart was activated 4 monts before the assassination on 22 Dec 1963. Jul 1977 Uranus at 9°GEM New York City electricity blackout took place on 13/14 July 1977 through lightning strikes. Uranus the ruler of Aquarius sign of the sky also rules discharge of electricity from the sky. Also defined as the Anti-Sun Uranus represents the antipode of the Sun the planet of electrical power stations and of light. Nov 1989 – Mercury at 25°CAN 1st climax of Perestroika – Fall of the Berlin Wall. Mercury indicator for negotiations, clever management and optimal use of situations and ressources stood for the clever management of the outcome of the process of political change in Russia through the US government. The initial phase of the George W. Bush presidency can be assumed to have seen a hidden US collaboration with the Saudi-Arabian allies and their sunnite terrorist armies Al-Kaida (later ISIS). The Libra atmosphere made the USA look and act like a victim during the 9/11 events. The war in Afghanistan seemed like a defensive reaction and to some extent it certainly was. But later the Libra context was used to sell the war in Iraq started in 2003 as a defensive reaction too. January 2004 Saturn at 14° LI the rythmical activation of Saturn in Libra in the beginning of 2004 fell 84 years after the foundation of the World League of Nations. It saw the climax of the destruction of the role of the United Nations . But even much worse was the deliberate destruction of the administration, police and army of Iraq that led to the complete disorganisation of the country with the effect of the Saudi – Sunnite terrorist armies aka ISIS & Co. taking over control over large parts of Iraq and later of Syria, Libyia and a number of African countries. The USA had sold their Salvation Army angelic mode to the cause of destabilization of the Middle East. 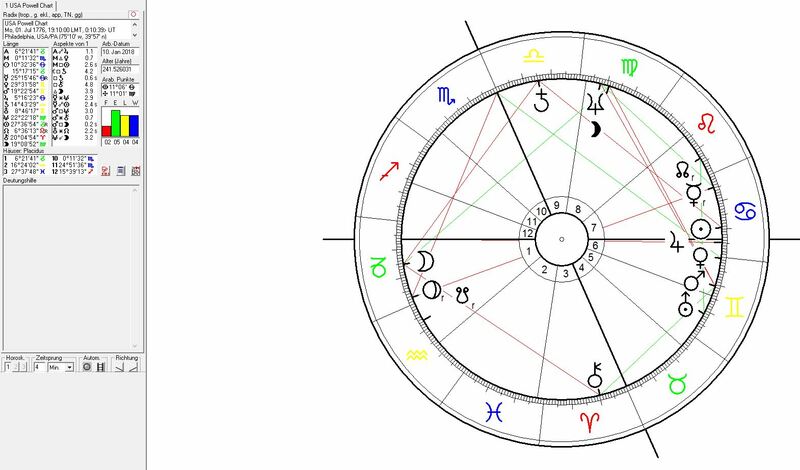 Seeing themselves as the helpers and promoters of the progress and democracy in the rest world had been misused by the Texan connection through the Saturn square to the Moon position of the US natal chart. Oct 1929 Virgo ingress from Libra Wallstreet Crash of 1929 and start of the period of economic depression that lasted froim Oct 1929 until the moment of the Leo ingress in April 1935 which brought the 2nd New Deal. March 1931 Neptune at 22°Virgo Neptune was directly triggered during the climax of the economical crisis and depression that followed the Black Thursday. Dec 1931 Lilith at 18°Virgo the activation of Lilith the dark moon during the climax phase of economical crisis and depression stands for a moment in which the country had to face the suppressed reality and effects of ignorance. Jul 1940 Pluto at 28° CAP German attack on France & UK, Battle of Britain – period of Japanese expansion in China and the Pacific. Pluto stood for the pressure through the threat from the Japanese and German expansion. 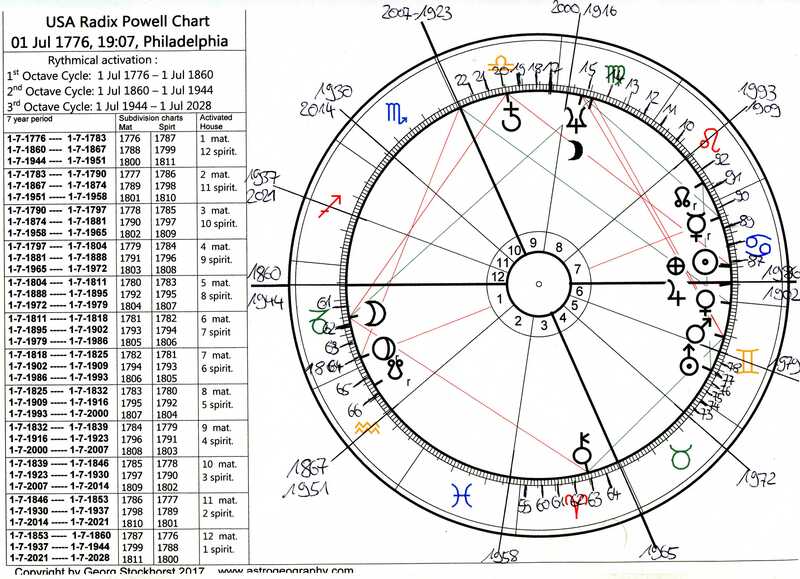 Im suggesting to use the timeline of activation of events in the Powell Chart for verification of the fuller meaning of the planetary positions. The Moon on 15°Capricorn in house 1 along with Pluto at 28°Capricorn in house 1 can be understood as aspects that guarantee the stability of the US central state. A big thing for such a huge and complex country, federation and especially a democratic system. 15° Capricorn is the simile for the heart and center of the ruling castes. It guarantees that the bosses are always the rulers. It may allow a small amount of self.made bosses but only the bosses rule. That position indicates that hierarchy is systemical in the USA – consider how the qualification for higer education is limited to the upper classes, how strong employers are in relation to trade unions, the political method of suppression of the poor, the state of the social security and health insurance system in the USA, the dominance of big companies over small and the worldwide dimension of that organized rule of the US economical system. As it is a real historical event the chart must have some level of effect and meaning! But then wow that Moon-Pluto conjunction at 28°Capricorn has all the negative emotionality for the people you could get. Made me think of the lines from the statue of liberty first: “…Give me you tired your poor – Your huddled masses yearning to breathe free – The wretched refuse of your teeming shore – Send these, the homeless -tempest-tost to me – I lift my lamp beside the golden door !” Yes that constellation would make the USA something like the last refüge for the tortured and lost. But not the nice and peaceful one for sure. Im not saying that there may not be some reality in that chart – it shows sth. behind or below the superficial image of the starts and stripes. Id see this as the chart of the negativity of the US – the KKK, the slavery system, the slaughter of the buffaloes through shooting from trains, the reservations for the native americans, the caste system and the dominance oand violence of the ruling mentality in the gunpower society. That chart has its level of reality to it – but it doesnt describe the bigger image of the USA – I`d say. That is rather like one element – sort of the bad end of the States. The rythmycal activation of this Moon-Pluto conjunction would have been due by 1789 (! ), 1873, 1957 for the materialistic level and by 1847, 1931 (! ), 2015. In fact this constellation in house 2 the field of of possessing and conquering territory makes this the chart of the pioneering, the stealing of the land from native americans, the ruleof violence over individual rights, the dominance of the big companies over the american land, society, legislation and political structures (Pluto in Capricorn in house 2).